How do I know if my students know? How do I get them to know if they know? Whether that is a skill or content, I want to know if they know it. I no longer think it is acceptable for me to guess or get a feeling on whether or not they know it. Getting the students to know if they know it is downright hard, but I am really attempting to get to a point where the students can recognize their understandings or progress on their skill levels and content knowledge. Therefore, the purpose of this year of reflection is to see how I make progress towards these two goals and elicit feedback from staff, students, and hopefully people who follow along on the journey. You can read how last week went here. 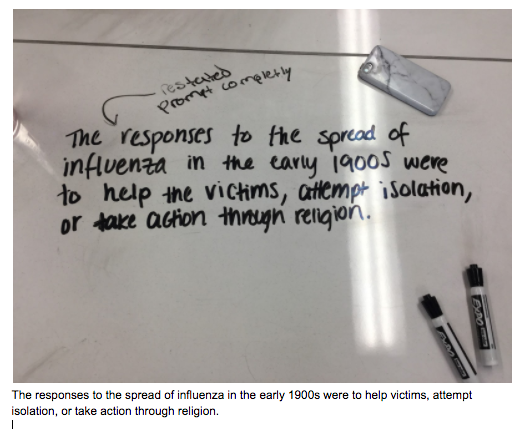 Analyze the responses to the influenza pandemic of 1918. This week's skill focus was still centered on analyzing charts, maps, and texts and pulling evidence from documents to support a claim. Write one cause/effect, and one comparative short response that reflects an understanding of essential content. Analyze charts, maps, graphs, and texts. Write a thesis statement, contextualize a prompt, and draw evidence from two documents to support the thesis. We need more work on perfecting our DBQ to get at least 4/7 on the AP test, also we need to go over the structure of the short response and what we need to include in the short response to get 3 points every question. Also, maybe some practice content questions from old AP tests to help us get more comfortable with the multiple choice portion of the AP test. I think we need more practice DBQ’s, in my opinion. Along with that, more practice on the short answer. If we write DBQ’s this week, we should write with a partner and try to exploit each other’s strengths. Individual writing for sure + work on grouping the documents by ourselves with you checking occasionally to make sure we're on the right track. Sometimes when we analyze documents all together I think to myself that I would have never come up with that by myself. I like the idea of working through a DBQ together in class and practicing the short answer. However, what I would like is a DBQ that we can work on completely by ourselves either at home or on a couple of quiet, workshop days. From these student responses, I changed the whole week. The first change was to the beginning of class. Each day, I started with an environmental question, but the daily question rotated through time periods. The goal was to focus part of each day on the short answer and how they approach each question. Towards the end of the week, I had the students do a more formal short answer question that I evaluated. Here is some of the lead-up work to the short answer. In the above picture, I the students brainstormed ideas centered around the environment in the early twentieth century. 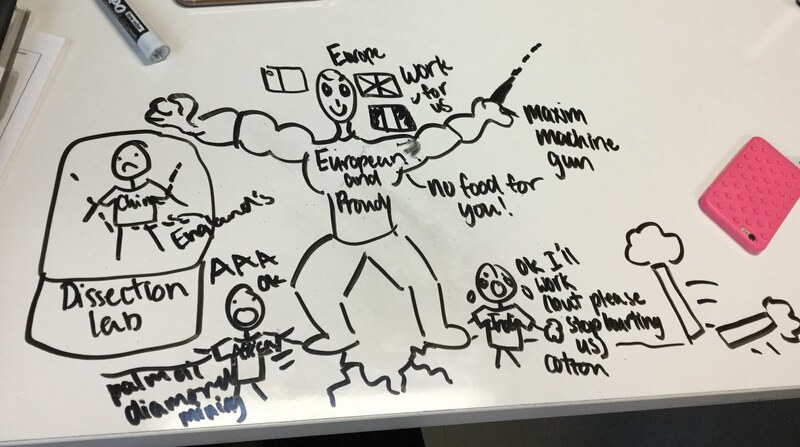 Another day, the students drew out their understandings of environmental changes in the nineteenth century. The second major change I made due to the student feedback was centered around the document based question. A lot of students felt they needed to be more independent but still valued peer feedback. To satisfy both, I took an idea that I got from Hazel Mason on using digital student portfolios. The students created a Google Document and shared it with me. For each stage of writing, a peer gave the student feedback. After they received feedback and made any necessary changes, they took a picture of their work and placed it in the document to be checked by me. The process allowed me to see the peer feedback and gauge the current ability levels of the student writing and the one giving feedback. Most of the feedback prompted the students to fix their writing without the need of me. I saw tremendous improvement in the students' ability to tackle an environmental short answer question. I keep forgetting how much time it takes to look at questions outside their comfort level and approach it from different vantage points. After five days of attempting to shift their thinking about the environment, they started to naturally change their approach to the questions. Without my prompting, they thought from multiple perspectives. As for the digital portfolios, I LOVED them! I want to implement it earlier in the year next year. Mainly because the students could then see the progress of their writing throughout the year. I know writing portfolios are not a new thing, but they are for me. I love that they made the students learning visible and allowed for a great medium for feedback from peers and me. The biggest improvement from using the portfolios was in the students' ability to connect two or more documents to each other. Normally, the students more or less listed documents. They would merely say what the document was and what was in it. Then do the same for the next document. I am always attempting to get the students to have the documents relate to each other through the use of qualifiers in their writing. After the changes, I know the students have improved in that area of their writing. Here is a sample of that in action. One downside to the portfolio process was that it took a lot of class time. It took four days of the week and most students did not finish the essay. From that vantage point, it seems like a failure. However, I contend that the time was worth it. The feedback the students gave to each other was worth it alone. For next time, I need to have something at the end of class to break up with the writing process. The process required a lot of mental focus and exhausted most of them in a very short period of time. I hope to have an end of a class activity that allows the students to talk about the process with each other. I am not sure when I first came across Standard Based Grading (SBG) or heard about the idea/theory of it but at this point in my educational career (this is my 5th year teaching) I have fully bought into the idea behind it. I have drunk the kool-aid and continue to drink it. Therefore, I am going to look at my own understanding of SBG and what conflicts and challenges I currently have. A specific question has come up multiple times now that has solidified my belief in SBG, “If you have a B in the class, can you tell me what you have learned in that class?” The majority of students cannot explain what they have learned in that course. Maybe they list a random activity that was done but that just means that they completed the activity; did they actually retain any information? Maybe? Yes? Probably something, but what? The same students will not list a specific skill they have gained. These questions make me cringe. In my - so far short trial of SBG - I have found a few very positive things and still have many questions and challenges. Can students still list or explain a standard 3 weeks from now? Does a rubric for each standard even need to be made? Does a generic work? Understand the causes of World War I. This semester, I am including, or trying to include student's perspective on the week. Last week, I had a rough teaching moment that led me to a provocation. Why am I not involving students in the lesson planning? Why are they not an integral part of the process? So, I asked my students if they would help me plan the whole week. The students helped me plan. I asked my class if any of them were available later in the day to meet with me to help plan the week. It was awesome! I was meeting students directly with what they needed. Here is a little bit of what they had to say. The Friday before we met to plan the week, the class was not focused on the task and behavior wasn’t the best, making the collaboration much more pertinent. 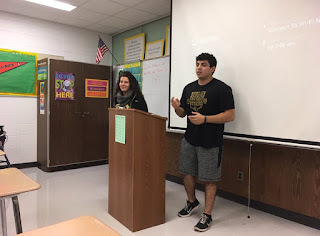 During the discussion, Kayla, Jose, Max, and I gave you feedback on things that could be changed or added to the curriculum. The following day when you implemented our ideas, I had a smile on my face to see that you were trying our suggestions. Okay, I am geeking out at this moment. I was hoping that all of you would recognize that I was implementing your ideas. First, I loved them! Second, I am learning with you. I want to maximize the time with all of you and make learning a joint effort. Also, we talked about going over pictures for DBQs also. We have done that and I feel like as a class we now better understand how to use pictures and put them into our DBQs. 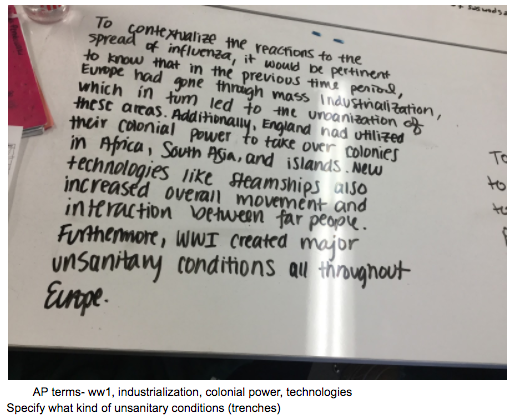 When we said the two minutes of class discussion on the board would help with context... you included that and now I feel like the class is getting better at understanding the context that we will use in DBQ. One of the biggest concerns that arose from the meeting was how they struggle with analyzing and understanding pictures. We came to the conclusion that class time needs to be centered more on the use of pictures. Therefore, the DBQ I gave them only had pictures. I agree with Kayla that it helped them have a better understanding. That week, I thought the class was significantly more focused than the week before, though there were a few occasions where a few people were off task. (Such as when we had a sub: a few students were doing homework for other classes or were on their phones but most were on task) I feel that the mini-lectures you give before a certain activity proved to be quite beneficial. Students can review the content that might be needed and get a refresher on either the time period or how a specific question should be answered. Continue the short two to three-minute lectures, but don’t make them too long. During the lesson planning, the students wanted me to lecture more. We worked through it and we came to an agreement. They would recall what they knew about a particular topic and then I would "lecture" on my thoughts for a few minutes. I would keep it short and the students would partake in retrieval practice in the process. Bill Ferriter has a lot of posts on lecture and their potential impacts. Here is a great read. As I have conducted these two-ish minute lectures, the recall process in a low-stakes environment has provided me with great insights into what my students know and allowed for me to correct some of that misinformation. 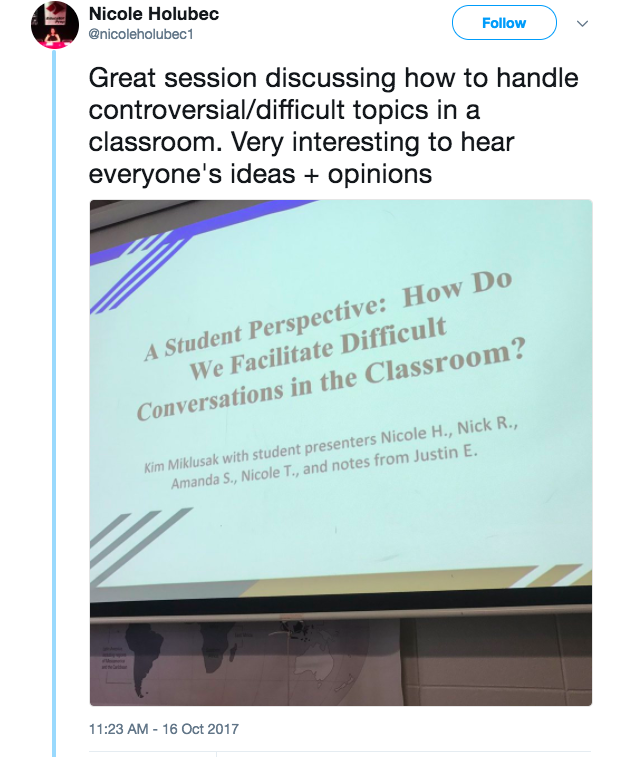 I feel as if the students were more engaged, not only us, but the rest of the students were. I saw a little more life and seriousness in the classroom than usual. Even when Heintz wasn’t here students were engaged. Jose corroborated Kunal's idea that the students were more engaged in the week's lessons. I was out one day for a district event, and they both stated that the students were more engaged when I was not there. I have really enjoyed coming to the Collab Lab and working with you. 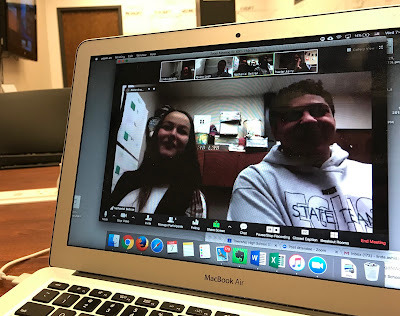 This was one of the first times that I’ve ever gotten the chance to plan the school week, and it was a new experience for me, allowing me to learn the numerous things teachers have to do behind the scenes when it comes to planning and all the considering of whether what they’re doing is effective. Thank you for the opportunity! Why is this such an anomaly? Why aren't students a part of the planning process? Granted, it took me twelve years to get to this point. But his reflection is a testament to the impact it has had on his learning experience. Imagine if we all did this? I received the best insights of my career from the students in that planning session. As a whole, the students were more engaged in the lessons. I attribute that to planning with the students. As I type that statement, I realize that is such a no-brainer comment. Of course students would be more engaged if they planned it! I feel like it puts the students and me on a level of mutual understanding and respect. I am there to help them and they are there to help me. I want the school to be engaging and create a set of conditions that maximize learning. I feel that planning with the students creates conditions that encourage learning. I have decided to take a few moments next week to include the entire class in the lesson planning process. It will use class time, but I am hopeful that it will maximize the rest of the week. Eliciting feedback from the students reminded me of how great my students are. Furthermore, I have been teaching this course for ten years, and I am still learning. There is so much to learn and the students are going to help me learn more than I will them. Looking to make changes in your classroom? 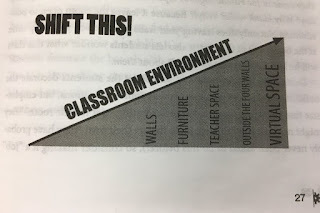 Book rec: Shift This! Are you looking for a way to shake up your classroom space or instructional practices? Are you a mid-career or veteran teacher who is looking for a new way to accomplish your classroom goals? Are you a new teacher looking for a way to start off your practice in a new way? Pick up the book Shift This by Joy Kirr! I first "met" Joy when I attended the ISTE Conference in Atlanta...except Joy wasn't even there that year! I went to a session on #GeniusHour, another name for a very similar practice of the 20% Time Project that I was hoping to implement for a unit in our American Literature course. 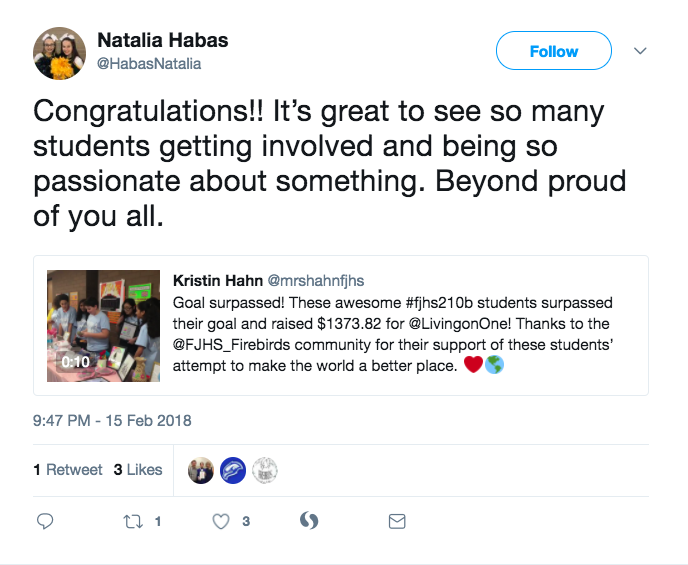 I connected with Joy via Twitter and found out that quite by chance she teaches in a district right near mine. She was only too happy to meet, share her resources on her Live Binder site, and connect me with others who were doing similar projects. This one shift in one of my units has influenced my teaching over the past few years as elements of it have seeped into more of my courses. But that wasn't the only lesson I picked up from interacting with Joy on Twitter. 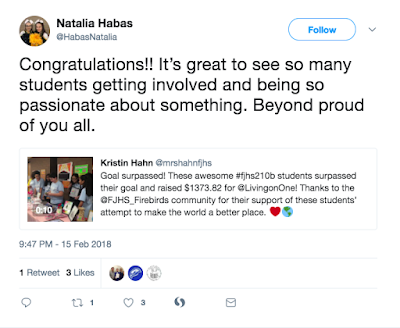 She has systematically moved to make her classroom space more student-centered, getting rid of her desk, having student working stations, and even broadcasting student voice and work on Twitter. I made little steps: I moved my desk to the side, I opened my closet for students to take their own supplies...and eventually I moved to getting rid of my desk. These little changes over the years have made such a difference. Most recently I have picked up from Joy the importance of #First5Days. What we do in the first week of our classroom sets the stage for our year. Do we review rules? Or do we jump right into getting to know students or starting our learning. Every little shift makes the difference. The best thing about all of this is that Joy then went and put all of her excellent and practical ideas into her book. Each chapter centers on a different area: classroom environment, homework, grading, student-directed learning, and more. She shares her stories in her own voice and describes the processes she went through to change. She acknowledges it isn't always easy but stresses that we don't all have to shift at once or even shift in every area. But what she does do is start each chapter with questions that we as teachers may have that we hope to consider and resolve. She then provides very clear examples of how she has done this in her classroom (including some photos! ), external resources for more information, and note taking sections for us to reflect on our own practices. If you're interested in more information, I would begin by following Joy on Twitter. And if you'd like to do more of a book study with a virtual learning cohort, please reach out to the CollabLab as we will be doing a book study and chat with Joy and peers over three weeks starting in April. 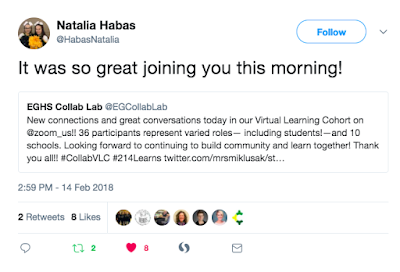 Over the course of the last few years, it has become more routine for us to include students in our Collab Lab's Professional Learning experiences––not just to participate, but also to plan and lead sessions with teachers. Whether for our Teaming on Tuesday Workshops, Virtual Learning Cohort, Peer Observations, Institute Days, whenever we partner with students we learn so much from their perspectives: how they learn best and what motivates them in their learning. Their insight and thoughtful questions provoke us to reflect more deeply and make shifts in our practice based on their feedback. At the same time, the students learn from the teachers and why we make the decisions we do. We build mutual understanding that contributes in an important way to the culture of learning of the school. And, after all, the students are the reason we're all here, so it only stands to reason that they should have voice in what learning looks like for them! 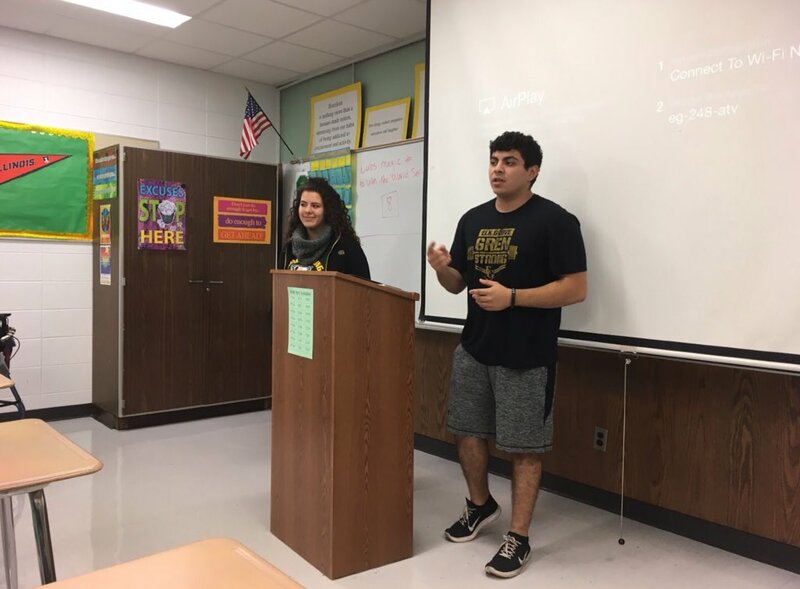 To ensure that student voice is more routinely embedded in all that we do, this year we have invited two students, Freshman Natalia Habas and Senior Nathan Beltran, to join our Collab Team of teachers. In addition to joining us for scheduled meetings, they often drop by simply to see what's new, offer to help with our latest learning ventures (often inviting more students to join us), share insight from their classroom or external learning experiences, or share a new inspirational "Weekly Quote" on our Whiteboard wall (totally their idea!). It's becoming a genuine partnership. In all of these shared experiences, we become learners together. We walk the walk of one of our favorite Collab Lab mantras: "We are all teachers, we are all learners." Together we stretch our thinking, problem solve, explore possibilities––and we have fun, too! Wonder what it all looks like? Sounds like? Read on! 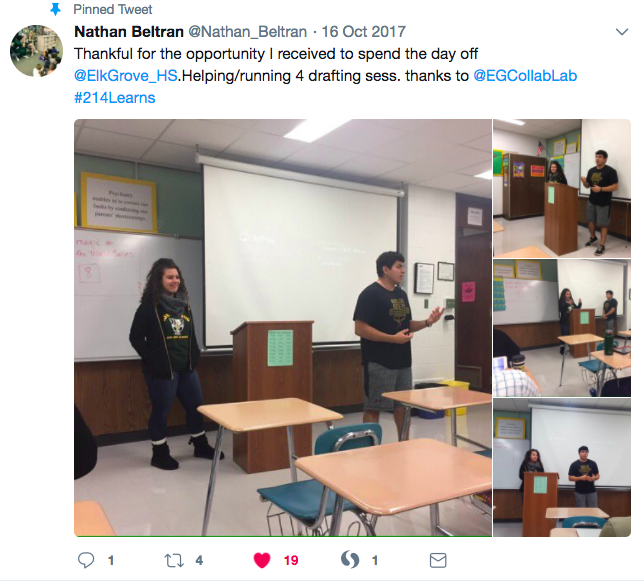 Students lead Institute Day sessions. Students join Instructional Coaching sessions and Peer Observation Experiences. Following class visits they ask probing questions and offer feedback. They really do make us reflect more deeply on why we do what we do. knew if the students learned, and how he followed up when they needed support. 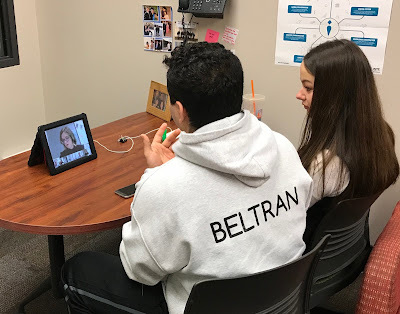 via Zoom in our Virtual Learning Cohort focused on Student Voice in Learning. Learning is serious business, but it's fun, too! Check out the video clip below from a recent Virtual Learning Cohort conversation. Teachers invite students to share feedback and help plan future lessons. 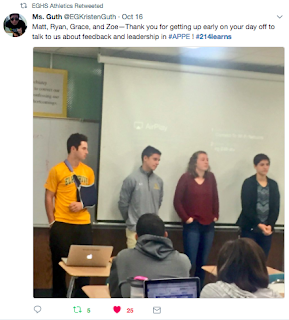 To read more about how Mark Heintz solicits feedback from students, check out his weekly Collab Blog posts: A Year in AP: Student Feedback and Reflection. Students join us for Teaming on Tuesday workshops. 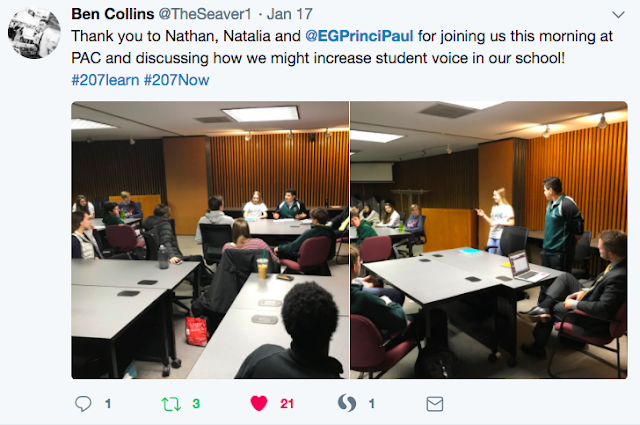 Students collaborate with Principal Paul Kelly to explore possibilities to broaden student voice school-wide via an Advisory Group. 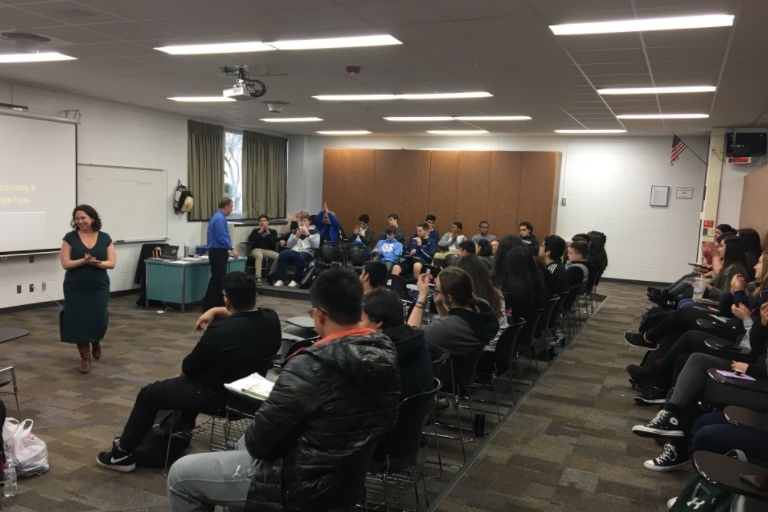 They visited Maine South High School to exchange ideas with Principal Ben Collins and students. Natalia and Nathan listen and learn from Maine South HS students and then present their ideas to the group. Students share their learning experiences via Twitter. Nathan shares Institute Day experience with shout out to teachers. facilitated by English teacher Kim Miklusak and a panel of students. Friendship Junior High School for their community service. Nathan shares experience reading with elementary school students. 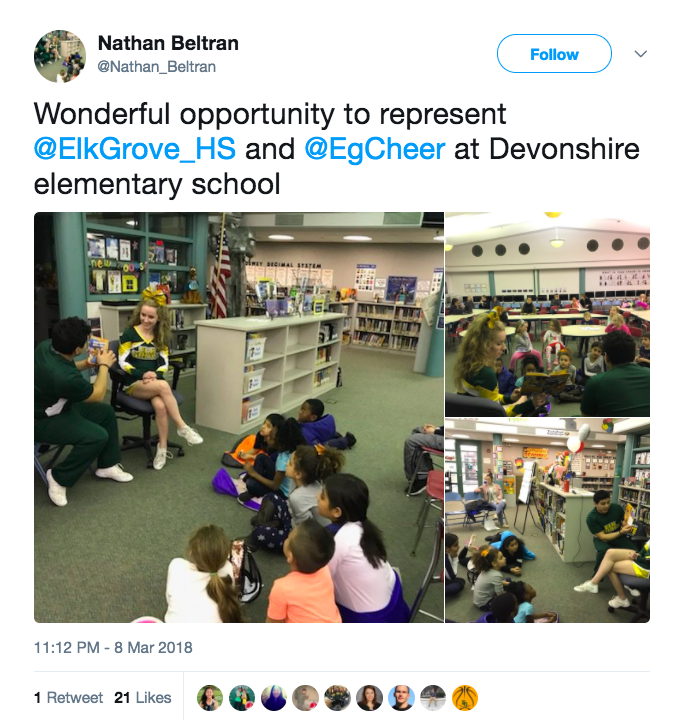 posts that reach hundreds of readers in the Elk Grove Community and beyond. 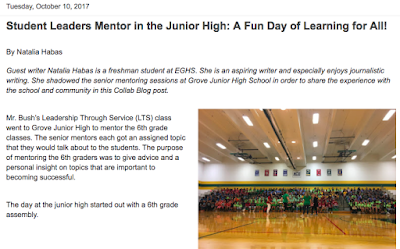 Student Leaders Mentor in the Junior High: A Fun Day of Learning For All! Feedback from both staff and students on the impact of all of these learning experiences has been overwhelmingly positive. 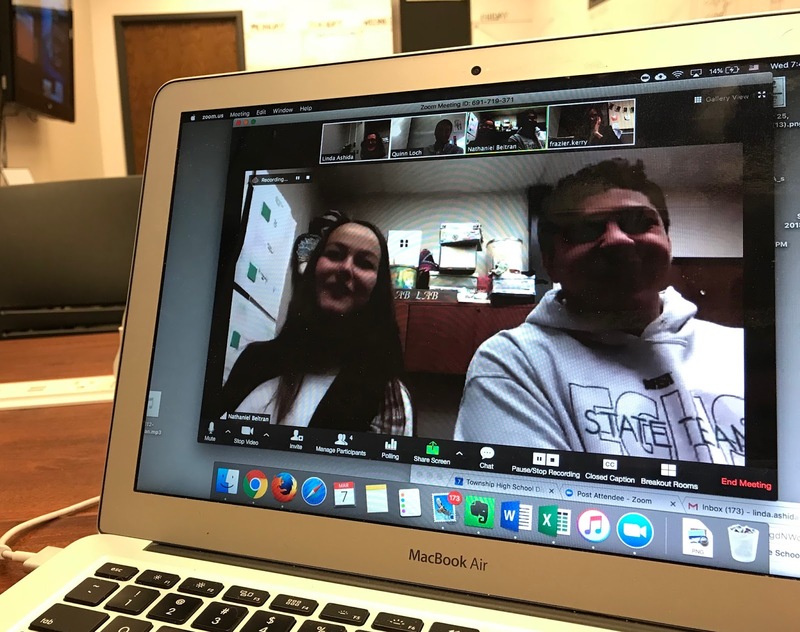 In the future we plan continue to make it even more the norm to Connect-Learn-Share with students––to partner even more in our learning together! Understand how old empires dealt with the changes in the global distribution of power. First, how do I know that the students know the content and how to do the skills? This semester, I am including, or trying to include student's perspective on the week. 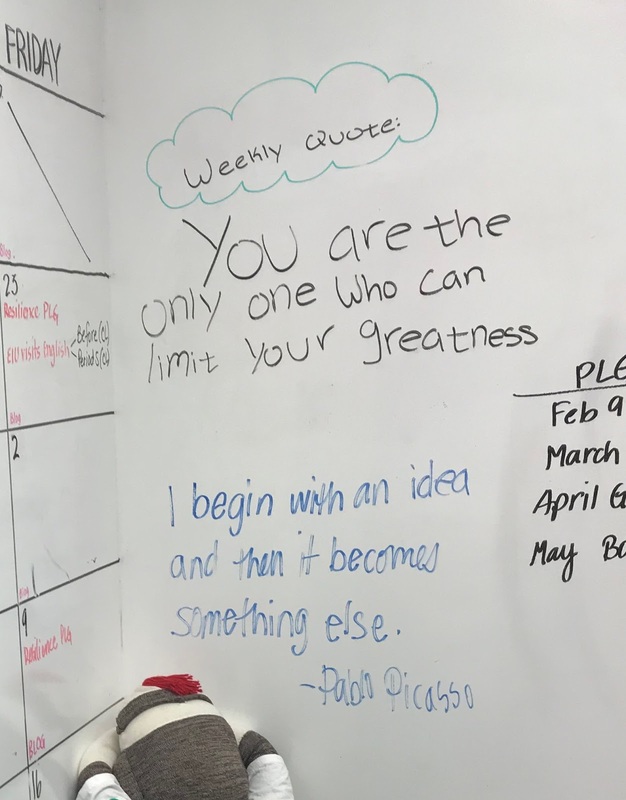 For this week's post, I asked two students to document their learning on the standards. It was a great week to do this, for I missed two days this week due to a family emergency. I shared a Google Doc to document their progress. Each day, I looked at the shared document to view their understandings of what took place during the day. Kunal volunteered to reflect on the week. Kunal: On Tuesday of this week, we brought back some skills that we hadn’t focused on for a while: writing a short answer and answering stimulus questions. I’m glad that Mr. Heintz decided to revisit these two important parts of the AP test because all of us need to keep practicing them to be prepared for the showdown in May. After doing the particular activity our group of two was assigned, we rotated tables and gave each other peer feedback, giving us the chance to see how others went about answering each question. 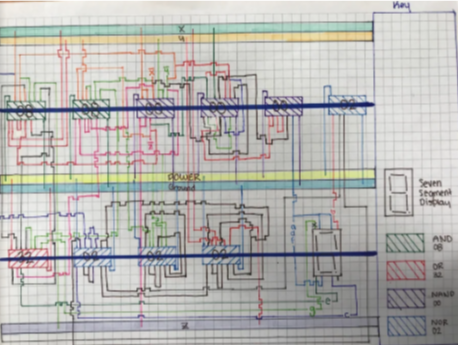 Kunal: For me personally, I like it when things are organized in a chart or enhanced through statistics or pictures; I am a visual learner. Today, we organized all our knowledge of the Qing Dynasty and primarily focused on the continuities and changes from 1450-1750 and from 1750-1900. This activity allows us to actually understand how Qing China is being impacted by global processes/outside forces and can be very helpful in our writing. Kunal: I LOVED this writing practice we did in class today!! For this, we had to analyze the effects of the Tanzimat Reforms in the Ottoman Empire from 1750-1900 by providing three examples of reform movements and resistance to those reform movements. We were given five sources/documents to analyze and to implement each of them into our argument. Each paragraph had to be a minimum of three sentences and had to have a claim, evidence, outside source evidence, and solid reasoning. What I like about this activity was that we got instant feedback, instead of having to wait until Mr. Heintz came over or until everyone was done so we could go over it as a class. For example, after writing the claim for a source, I used the eraser tool in notability to see what a good example looked like, and I could then compare mine to the one underneath the question mark. Another good thing about this activity was that it was timed; each paragraph needed to be written in four minutes. Although being under time pressure was stressful for many, now is the time to simulate the AP exam. I am someone that likes to take my time, but time is of the essence! Kunal: As a way to wrap up class on Friday, we looked at student-written examples of a thesis to be exposed to great and not-so-great examples. Our goal was to rank them from 1 to 5, but to tell you the truth, a lot of people were off task. This frustrated me :( and a few others, and led to Mr. Heintz giving the class a lecture on behavior and talking about how each of us was responsible with taking the initiative to prepare for the AP test in May. We lost a lot of time that day… The class needs to stay more focused moving forward! There is a lot to unpack this week. First, Kunal highlights the revisiting of some older skill sets and continued use of peer to peer feedback. 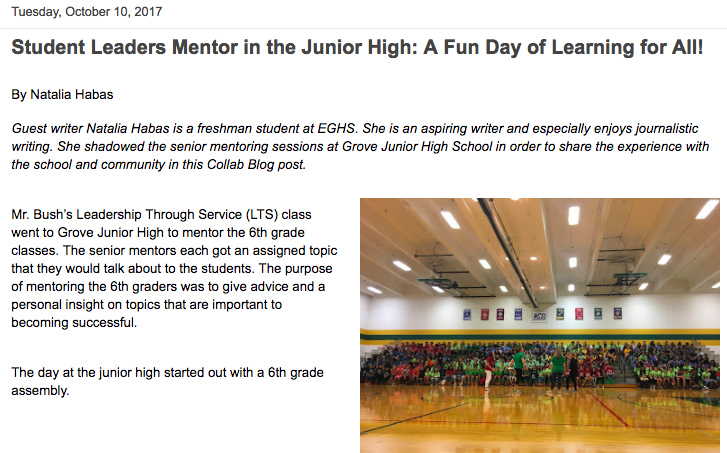 One of the goals in writing this weekly blog is to get students to know if they know how to do a skill set. While that is a goal, it is good to see that the students value peer feedback. Having them give feedback to each other that is meaningful and accurate is always amazing. Furthermore, my hope is that they don't need my feedback to validate their progress. 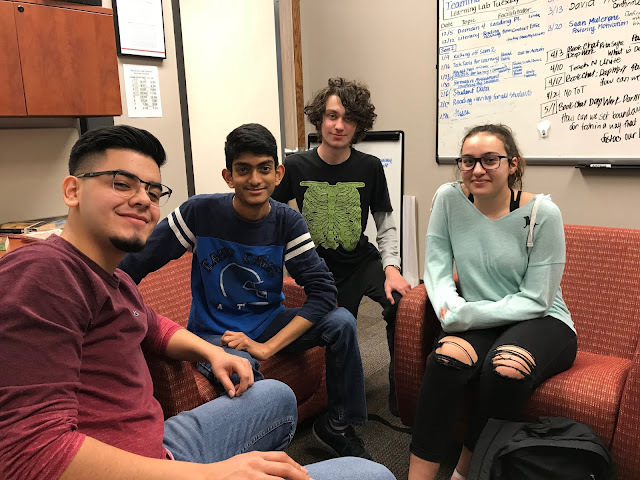 Later in the week, Kunal stated, "What I like about this activity was that we got instant feedback, instead of having to wait until Mr. Heintz came over or until everyone was done so we could go over it as a class." I LOVE the activity because they do not need me as much. They can read the model and critique their work. 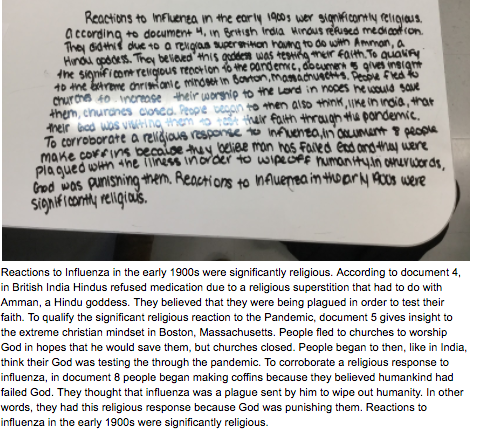 Further reflecting on the day, Kunal said, "Another good thing about this activity was that it was timed; each paragraph needed to be written in four minutes. Although being under time pressure was stressful for many, now is the time to simulate the AP exam. I am someone that likes to take my time, but time is of the essence!" It is nice to see that the students recognize the multi-layered approach to the document analysis. The students have been asking for more time spent on the content. Therefore, I gave them the Notability document where they drag the information to a particular area. It was difficult for the students to sift through the distractors. At first, the students moved all of the items into a category. I had to have them pause to see if all of them should be used. I prefer to use these activities rather than lecture. Most of the students have been conditioned to prefer lecture because at the moment it feels like they are getting the most direct instruction and revelation. It is a constant battle to have students understanding in what contexts do people learn best. Unfortunately, that context is rarely lecture. When I do want to spend a particular amount of time on content, I tend to use documents, games, or activities like the one mentioned above. That being said, not one of my finest moments as a teacher occurred this week. Students were off task and as Kunal stated, I gave a lecture on behavior. To be honest, I sort of proved my point about lecture during the lecture, because many students were not engaged in what I was saying. Also, the off-task behavior was due to a lack of learner agency and poor design of the lesson. This reflection led me to potentially one of the biggest impacts on my teaching career. Why am I not involving students in the lesson planning? Why are they not an integral part of the process? So, I asked my students if they would help me plan. That is the shift for next week. The students helped me plan and I am hoping to get them to share their story with me and you. Last week we had our first taste of warm weather, stirring up all those spring feelings: the hope that we may have shoveled snow off our car for the last time, the anticipation of shedding our winter coats & commuting during daylight, the excitement & anxieties we share with our students over the springtime rituals of AP testing, and the bittersweet acknowledgement that we will be letting our seniors go to pursue their various academic and career paths. Each year around this time, I look at my senior composition students, reflect on how tremendously they have grown in their writing and how delightful they are as young adults and wonder have I done enough to get them ready for the next step? 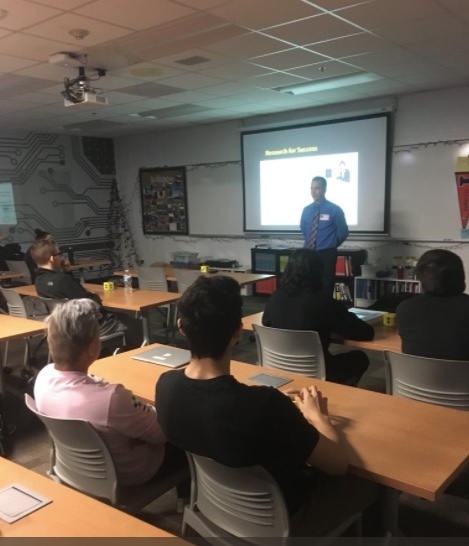 In the Dual Credit and English 101 courses, the question at the forefront of our planning is how to blend challenge and support so that our students can have as seamless a transition into their college coursework as possible. The new partnership with Eastern Illinois University has been instrumental in providing us with the insight we need to continue to do this better. 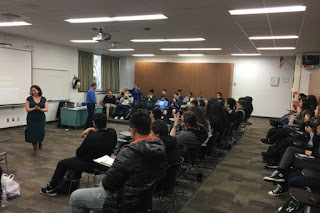 On February 23, we were delighted to host Dr. Timothy Taylor, Director of Composition at EIU to speak with College Composition, Speech 101, and English 100 classes. (1) Students must have a growth mindset. They must believe they can and will improve their writing through practice and study. (2) Students must work hard -- they must seek to improve their skills. (3) Students must practice discipline -- completing writing assignments on time and with quality. (4) And finally, students have to care. When students care about improving their work, they will take feedback, apply it and see improvements. Growth mindset is a concept that is familiar to many of our students. We discuss it in our classes, model it when we show them how to use feedback, and use language that supports growth and improvement. Dr. Taylor engaged students in a real-time critique session of an essay from a student in the on-campus section of College Composition. As students commented on the model, they identified some of the errors they are making in their own papers. Students were able to identify weaknesses in thesis, organization, and analysis in the model essay that correspond to the weaknesses they are seeing in their own essays. 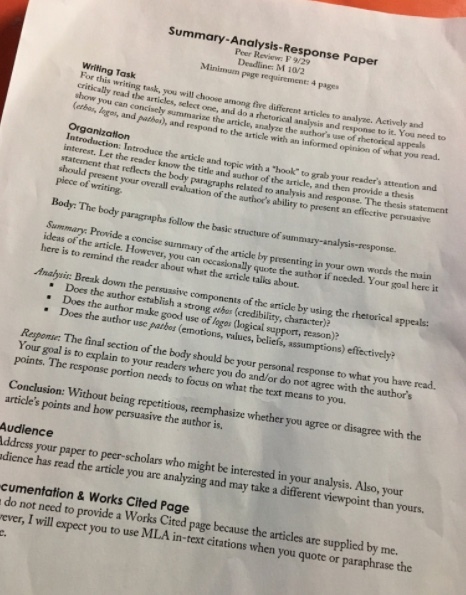 As Dr. Taylor then presented elements of the revised paper, students were able to see growth mindset at work - what was once an average essay (students graded the original a C) became an A essay with a complex thesis, well-argued points, and strong analysis of supporting details. Dr. Taylor’s presentation echoed the messaging we pass on to our students as a course team. Writing is a complex set of skills that requires practice, attention, and revision. We strive to give them clear and timely feedback that focuses on the big picture - how well they are articulating and supporting complex ideas in writing, rather than on the specific - particular constructions for paragraphing or rules of grammar. Above all, we strive to make grades a benchmark for improvement, not an assessment of a student’s worth as a writer. Through our portfolios and student reflection processes, the team is working to improve students’ metacognition and integrate growth mindset in their writing. For this week's post, I am being more transparent. If you have been reading the blog, you have gotten glimpses of what the class looks like. I now would like to offer an opportunity to view an entire period! A week ago, Linda Ashida Periscoped my classroom to few people in other high schools. They virtually visited the class and then we had a follow-up meeting to discuss the class and learn together. I broke the video into three parts. It is a typical day, in which students are working with documents. To give more context to the exact process of the class, I wrote a blog post about the class, which you can read here. I feel that it is imperative that schools be more transparent with the larger community. We need to document as much of the learning that takes place in our buildings and make it transparent to all stakeholders. So much of dialogue around schools and learning takes places without teachers and students in the conversation. By being transparent, we are brought into the conversation. Furthermore, we need to shift the narrative of what learning is to provide evidence to the community that children are amazing and learning valuable skills and knowledge along the way. Hopefully, by opening my classroom, it allows for others to do the same and shift some conversations about what schools towards a positive message about what they are and what we could do.